This is a knife that requires little in the way of an introduction. The Cold Steel 4-Max is arguably the most overbuilt hard use folding knife of all time. Modeled after designer Andrew Demko’s custom 4-Max folder the 4-Max brings Andrew’s clean design and attention to detail to life. This isn’t your garden variety Cold Steel offering. Built in the USA and retailing for about $400, this high end production offering is for those that want to get as close to an Andrew Demko custom as they can without buying and actual AD custom. I’ve wanted to check one of these knives out ever since they announced the project in 2014. 4 years later and I finally have one in hand. Will the knife survive the hype? Read on to find out. The 4-Max has an overall length of 10.00″, a 4.00″ blade and weighs 10.2 ounces. This is a big honking knife. As you will be able to see in the size comparisons, if the Ultimate Hunter is a great white, then this 4Max is a megalodon. It dwarfs normal folding knives. It’s almost a caricature of a folding knife. It’s massive in every way. Some may view a knife this big as novelty item rather than an EDC. Personally, I like mine for trips to the supermaket and high stakes hostage negotiations. My 4-Max is made in the USA, but Cold Steel has moved manufacturing over to Italy. They changed the G-10 from the tan shown here to a blue grey on the Italian version. Personally, part of the allure of the 4Max to me was that it was made in the USA. It’s a knife so ridiculous that it almost needs to be made in the USA. Otherwise it’s just an imposter. That said, my research shows the Italian 4Max is very nice, and possibly even a smidge better than this USA version in the fit and finish department. The blade on this sucker is massive. It’s a simple drop point with a deep belly, high flat grind, and decorative swedge. The grinds are crisp and even. The edge has been evenly applied, although the sharpener did run up onto the choil a little. That seems to be consistent from knife to knife. I’m not a fan of how that looks, and is one of my gripes. You would think a knife this overbuilt would be a poor slicer, but the 4-Max actually has great blade geometry. It slices beautifully thanks to the high flat grind that gets surprisingly thin behind the edge. I can slice apples like nobody’s business with the 4Max. The tip also displays a good balance between strength and practicality. It’s stout, but isn’t a pry bar either. The knife is fully functional and surprisingly good at performing day to day tasks. For blade steel Cold Steel went with CPM-20CV. CPM-20CV is Crucible’s answer to Boeller M390. It’s excellent stuff providing a covetable blend of edge retention, ease of sharpness, corrosion resistance and toughness. It’s a high end steel. So far it has done everything I’ve asked it to. Admittedly that has mostly been EDC chores including breaking down boxes, cutting fruit, and opening mail. I’m keeping this knife for long term evaluation and will update this section periodically. The Handle of the 4-Max is G-10 over titanium liners with a titanium backspacer. Handle construction is solid. The G-10 scales have been nicely finished. All the parts line up, and the overall impression is solid. So far the tan G-10 has held up well. I’m not a huge fan of light colored G-10 as it tends to pick up dirt and stain, but I haven’t had that issue with the 4-Max. The ergonomics of the 4-Max are excellent. This is a huge knife, so there is plenty of real estate, and Andrew Demko is well known for his simple and ergonomic designs that accommodate a variety of grips and hand sizes. The ergonomic features include a generous forward finger choil, lightly textured G-10 handle scales, and a short run of toothy jimping. The jimping is nice because it captures the pad of your thumb without being overly aggressive. All the edges of the G-10 have been chamferred. I haven’t noticed any hot spots. The balance point of the knife is an inch or so behind the pivot, so it has a forward heavy feel. It all but begs to be chopped with, an odd sensation from a folding knife. The pommel is large and angular and could be used as an “impact tool” if the need ever arised. The 4-Max is also comfortable in a reverse grip. Time to talk about the pocket clip. This is a large titanium pocket clip. It allows for right or left side tip up carry only. It’s not a deep carry clip, but it’s oriented so that the knife buries fairly deep in the pocket. Spring retention is excellent. In practice, this knife carries as you would expect. You need to wear a belt while EDCing the 4-Max, lest you wish to arrive at your destination in just your underwear. It’s big, it’s heavy, and it takes up a ton of space in your pocket. I wouldn’t turn up my nose at a belt sheath for this one. The 4-Max makes use of large ambidextrous thumb studs. Quite a bit of travel is required to pop this blade open. Thankfully the going is smooth due to the massive phosphor bronze washers. When you finally maneuver the blade into the open position you are greeted with a hugely satisfying “click”. It’s kind of like closing the door of a German car. Here is a size comparison with the Cold Steel Ultimate Hunter, a large knife in its own right. For lockup we have an oversized Tri-Ad lock. It’s got a stop pin bigger than most pivots. Lockup is absolutely bank vault solid. Not a smidge of play here, and according to Cold Steel this lock can handle ungodly amounts of punishment. No complaints with respect to the lock. Where I do have a complaint is when it’s time to unlock the knife. Tri-Ad locks can have a reputation for being tough to disengage, but this 4-Max takes it to a new level. Not only is a good amount of pressure required to release the blade (understandable), you have to position your thumb dead center on the lock release. If you travel too far forward or back, you won’t have sufficient travel for the lockbar to raise enough to disengage. Once you get the lock disengaged extreme care needs to be taken with this blade. The spring tension turns the 4-Max into a guillotine of sorts. Care always needs to be exercised when closing a folding knife, but extreme care should be taken with the 4-Max. The combination of strong spring, heavy blade, and razor sharp blade make this one a little disconcerting to use. I’ve never felt nervous closing a pocket knife before, but after catching the edge of my ring finger in this blade I have a new level of respect for the 4-Max. Be careful. Blade centering is good, but not great on my knife. It’s a mm or so off. No where near rubbing, but at this price point I would obviously prefer something dead centered. The 4-Max is the closest most of us will come to ever owning an Andrew Demko custom knife. It was built without compromise, and in that respect the 4-Max is a roaring success. If you are looking for the biggest, baddest hard use folding knife on the planet then I think the 4-Max should be at the top of your short list. It’s beautifully made, and it cuts surprisingly well. And I challenge you to find a more solid folding knife. My biggest gripe is it’s a tough lock to disengage. Not only is there a lot of spring tension, you have to place your thumb right in the center in order to successfully disengage the lock. However, if you are looking for anything resembling a practical pocket knife for urban EDC then I think you should look elsewhere. This knife is huge and heavy. No way I would want to carry it around on a daily basis. But it’s a beautiful and unique piece and I appreciate it for what it is. With the 4-Max, you are either going to love the idea of it or hate it. If you are somehow on the fence about the 4-Max I would suggest picking one up. It’s not cheap, but you get what you pay for. I recommend purchasing the Cold Steel 4-Max at BladeHQ or Amazon. Please consider that buying anything through any of the links on this website helps support BladeReviews.com, and keeps the site going. As always, any and all support is greatly appreciated. Thank you very much. An interesting knife, no doubt, but not my interest. I only have one CS knife, an American Lawman, and it was a bugger to unlock when I first got it. However, after playing with it for a week or so, it’s actually very smooth and unlocks fairly easily with little pain (and my fingers and thumb have almost healed up). However, the only CS knife that does interest me at the moment, is the Lucky 1 or 2 and the Tuff-Lite. Far more manageable sized. Thank you for the good review. I always enjoy what you bring to the table and have pleasure in reading all your reviews. Currently my every day carry is a Benchmade 575, which has been fantastic. I think that the Benchmade 570 could be a competitive option to the 4-Max, with less than half a inch of blade length, roughly 4 ounces lighter and under $200.00 dollars. The steel not quite as high end with S30v, however, I never have had any complaints with S30v with any folder I have carried. Thanks for taking the time out to leave a comment. Much appreciated. The 570 is a sweet knife, and I always liked the look of the Presidio, but I’m not sure it’s going to be as strong as the 4Max – it’s like a bear trap. The thing is unbelievably big and solid. Just my opinion. Thanks again. Great review. I ordered the new Italian version of the 4-Max, and it can’t get here quickly enough. One point of clarification. The 4-Max is a production version of the custom Demko 4-Max. 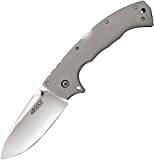 The AD-10 is a different model also made by Demko Knives. Like many Demko fans, it’s my sincere hope that Cold Steel will eventually release a production AD-10. Hey Brad, Thank you very much for taking the time out to comment. I’m glad you enjoyed the review. The Italian version of this knife looks excellent. And thanks for letting me know about the custom Demko 4-Max. I will update the review.